The Killzone Maxx broadhead was released for the 2013 season and has a large 2 3/8 inch cutting diameter. In flight the broadhead has a diameter of 7/8 of an inch. The original killzone broadhead has only a 2 inch cutting diameter. New archery products seems to have taken the success of the Rage broadheads and addressed some of the issues. The First thing that you notice with the Killzone Maxx broadhead is that it does not use any rubber bands or shock collar like the Rage broadheads. The blades are held closed by a tension clip that is very similar in design to the same tension clip used by the NAP spitfire broadheads. Second the blades are actually locked to each other so both must deploy at the same time which may alleviate the redirections that you get from the Rage heads opening unevenly. Now this broadhead is not for everyone, when shooting a large mechanical head like this you need to make sure that you have at least 80 foot pounds of kinetic energy to make sure you can get full penetration. If you are shooting less than that you would likely be served better by a smaller mechanical or even a fixed blade broadhead. 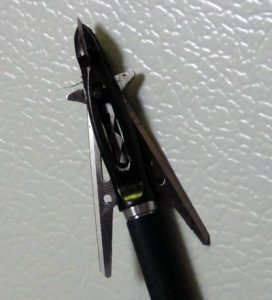 One part of the Killzone Maxx design that is problematic is that the bolt that holds the blades in place sticks out just enough that if you shoot through your target and strike something like a log you may actually bend that bolt with will result in a broadhead that you can no longer use. After what can only be described as a difficult season here in Illinois, I went to Florida with my father this February and got a chance to see what this head could do on hogs. I had practiced with this head out to 70 yards so I knew where it would hit. I got a wonderful 20 yard shot at a hog at let me tell you, I knew from the moment of impact that I was happy with this broadhead. 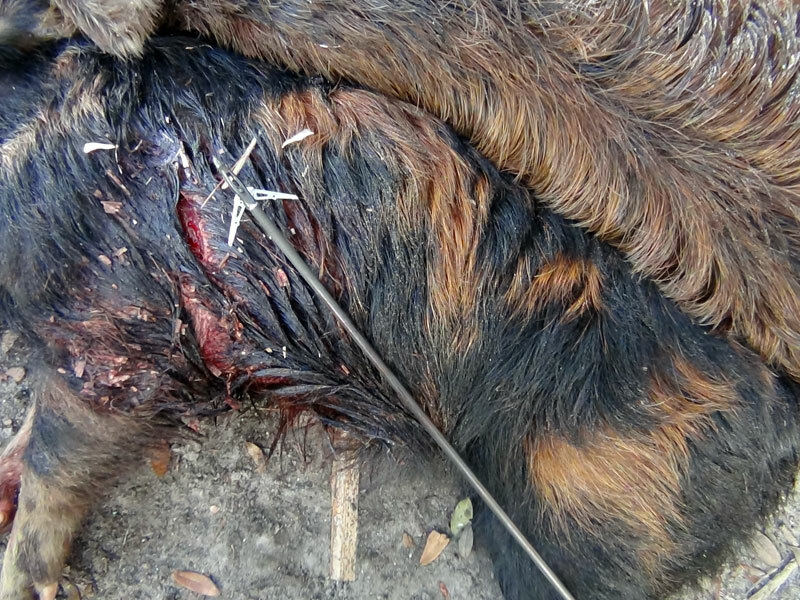 The tracking job was not difficult as the hog fell within 15 yards of the point of impact. After closer inspection the entrance hole was very close to 3 inches and the exit hole was about the advertised 2.3 inches. With this type of performance I am going to continue to shoot the Killzone Maxx and look forward to taking even more game with it, even though I will also have other broadheads in my quiver as always. For more information on the Killzone Maxx, click here. Due to its large cutting diameter not everyone should use this head. Bolt that holds blades in may become bent when striking hard objects making it impossible to replace blades.